Eltronicschool. - One of the implementation using transistor component as the semiconductor component is to buil electronic motor controller with supported with another component like relay and others. In this time, based on transistor, we will give you one of electronic circuit schematic of electronic motor controller look like in Figure 1. below. 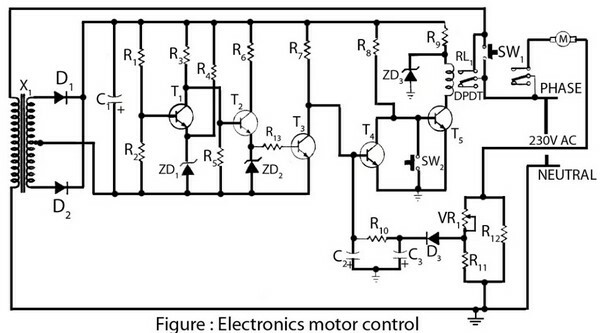 Circuit schematic like in Figure 1 above is electronic motor controller based on transistor. According Electronicsproject site describe that the power supply is given by pressing switch SW1 it shots the N/O contact of relay RL­1 which gives supply to the circuit. The current through resistor R8 gives the base current to transistor T5. Where transistor T1, T2 and T3 from the over and under-voltage cut-offs. Here the transistor T4 on when over or under voltage is given to transistor T3. For avoiding noise capacitor C2 with resistor R10 form a loss-pass filter and also give sufficient time delay. Here the resistor network (R11, R12, VR1) are used as current sensor. Where Diode D3 is as rectifier and capacitor C1 is used as noise filter of switching circuit.